Having declared independence once before only to have it reigned back in, the Caribbean island of Anguilla held a second referendum whose votes nearly unanimously favoured disassociating itself from the colonial governor of Saint Kitts and proclaimed itself a republic on this day in 1969. The chairman of the freshly constituted Island Council expelled the British envoy and for about forty days basked in its freedom. On 18 March, a contingent of paratroopers and London constables peacefully occupied the island and restored order. Disappointed by this denial for self-determination, negotiations ensued and Anguilla was granted the right to “secede” from Saint Kitts, which ironically gained full independence as the Federation of Saint Christopher and Nevis in 1983 while Anguilla remains an overseas territory. 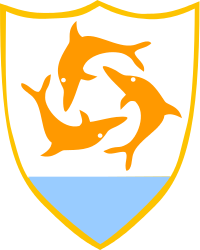 The triskelion of dolphins on the flag and coat of arms reminds one of the Manx flag, itself a crown dependency and neither part of the United Kingdom nor a part of the former empire.